Every week at Back Up, we share someone’s story with the rest of team. That could be an email we received from someone like Ste who had an amazing time on their first course, or a phone call from someone just to say how much they enjoyed a wheelchair skills session. Many of us will have met or spoken with Ste, so we know just how far he’s come and what it means. It’s these moments that make all our work worthwhile. Whether we’re on the front line delivering services, supporting our amazing volunteers or working on a press release in the office: we’re all a part of it. Seeing Ste and so many others transform their lives with our help inspires us to continue to support everyone who’s affected by spinal cord injury. Find out more about who we are, how we work and what motivates us to improve the lives of people with people with spinal cord injury by visiting the other pages in this section. 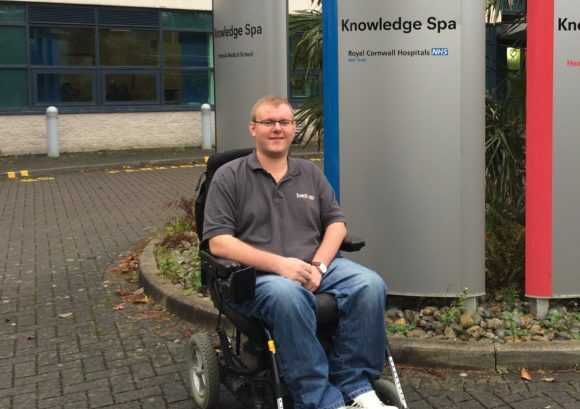 Andy works in spinal units with people who are adjusting to life after a devastating injury. £10 could pay for our outreach team to visit a patient and offer vital support.